Defense Secretary Leon Panetta said it was "disturbing" and "difficult to understand" Pakistan's 33-year prison sentence for a doctor who aided the United States in finding terrorist leader Osama bin Laden. Shakil Afridi, a 48-year-old Pakistani doctor, was convicted last week of high treason by a Pakistani tribal court for working with the CIA by running a fake vaccination program near the al Qaeda leader's compound in Abbottabad, Pakistan, in an attempt to collect DNA samples from bin Laden's relatives to try to confirm his location. "It is so difficult to understand and it's so disturbing that they would sentence this doctor to 33 years for helping in the search for the most notorious terrorist in our times," Panetta told me in a "This Week" interview. "This doctor was not working against Pakistan. 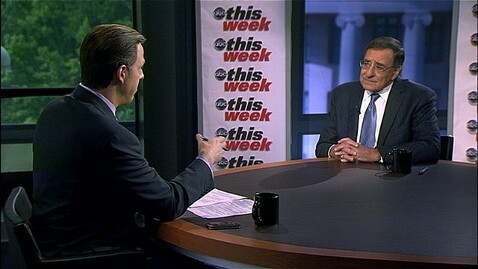 He was working against al Qaeda," Panetta added. "And I hope that ultimately Pakistan understands that, because what they have done here … does not help in the effort to try to reestablish a relationship between the United States and Pakistan." Afridi's conviction was met with harsh criticism by U.S. officials, amid already-strained relations with Pakistan after the discovery that bin Laden had hidden in the country for more than five years, before Navy SEALs raided his Abbottabad compound and killed him last May. Secretary of State Hillary Clinton called Afridi's treatment "unjust and unwarranted" on Thursday, while Congress proposed cutting aid to Pakistan by $33 million - $ 1 million for each year of Afridi's sentence. When asked if Pakistan can still be considered a U.S. ally, Panetta acknowledged the "complicated" relationship with the country. "This has been one of the most complicated relationships that we've had, working with Pakistan," Panetta said. ""It's an up-and-down relationship. There have been periods where we've had good cooperation and they have worked with us. And there have been periods where we've had conflict." "So our responsibility here is to keep pushing them to understand how important it is for them to work with us to try to deal with the common threats we both face," Panetta added. "And what they did with this doctor doesn't help in the effort to try to do that." Afridi's sentencing could also complicate negotiations over the re-opening of land supply routes through Pakistan for use by U.S.-led NATO forces in Afghanistan. After once charging $250 per truck, Pakistan is now pushing for $5,000 for each truck that passes through Pakistan carrying supplies. "We're going to pay a fair price. They're negotiating what that price ought to be," Panetta said of the deadlocked discussions. "We're not about to get gouged in the price. We want a fair price. " Pakistanis for their part have criticized the U.S. for its drone strike campaign in their country, with the U.S. using unmanned aerial drones to target potential terrorist targets - but sometimes leading to civilian casualties that spur resentment towards the U.S.
Panetta, however, called drone strikes "one of the most precise weapons that we have in our arsenal," and said that protecting U.S. security by leveling terrorist targets in countries like Pakistan and Yemen takes priority. "Our responsibility is to defend and protect the United States of America," Panetta said. "And using the operations that we have, using the systems that we have, using the weapons that we have, is absolutely essential to our ability to defend Americans. That's what counts, and that's what we're doing."